Annlin Suburb of Pretoria, South Africa. Annlin is a well established suburb in the north of Pretoria, South Africa. Residents often mention their love for the vegetation, the large matured trees, clean air and rich history behind every house. Conveniently situated 10 kilometres or about 10 minutes away from the city, Annlin suburb is a great area for the working families. For this reason, there is an increase in a number of young families and professionals who are moving into the area. There is also a growth in the small units developments and gated community lifestyle. Any kind of lifestyle is represented, from apartments, townhouses, stand alone houses, residential estates to smallholdings and large farms. The suburb is surrounded by nature and great landscapes. It sits below the Magaliesberg Mountains and close to the nature reserves like Wonderboom and Onderstepoort and a variety of museums and other Pretoria attractions. The easy access to the highways like N1 makes it easy for one to drive anywhere. Kolonade shopping mall is a walking distance away, whilst Brooklyn mall and Menlyn Pak are a less that 20 minutes drive. You will find everything you need from the Pretoria North shopping complexes but if you prefer somewhere else, you will have to drive as there is not much convenient public transport. There are great hospitals and good, well established schools with large sports grounds in the area. The University of Pretoria is a short drive away and Tshwane University of Technology (former Pretoria Technikon) is a neighbour. The country feel in some part of the suburb can inspire one to work from home and the rich culture cal lead entrepreneurs to turn their homes into Guesthouses. For the farmers, one can grow almost any fruit in the rich and matured soil of Annlin and north of Pretoria. From mangoes, olives, pears, peaches, prickly pears, citrus to a variety of vegetables and herbs. I lived in the neighbourhood. My huge stand had a lovely orchard at the back with a second house which brought extra income. Our house was an extension of a three roomed house that was built in the early 1900s with thick walls. The original plan is a plain and simple drawing without a bathroom. From that piece of paper I imagined how the first family lived in the dwelling without any form of security. Actually, the property still has minimal security. Some fencing and no cameras nor electric fencing. I really miss the simplicity of life, and a country feel so close to the city. Annlin and surrounding areas are truly peaceful and quite homely. What I miss the most is the relatively low crime rate. At least I never heard of an incidence in our neighourhood. Where to Stay in Annlin Suburb. 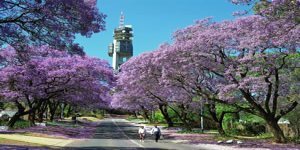 Enter the "my Pretoria surburb" article competition.